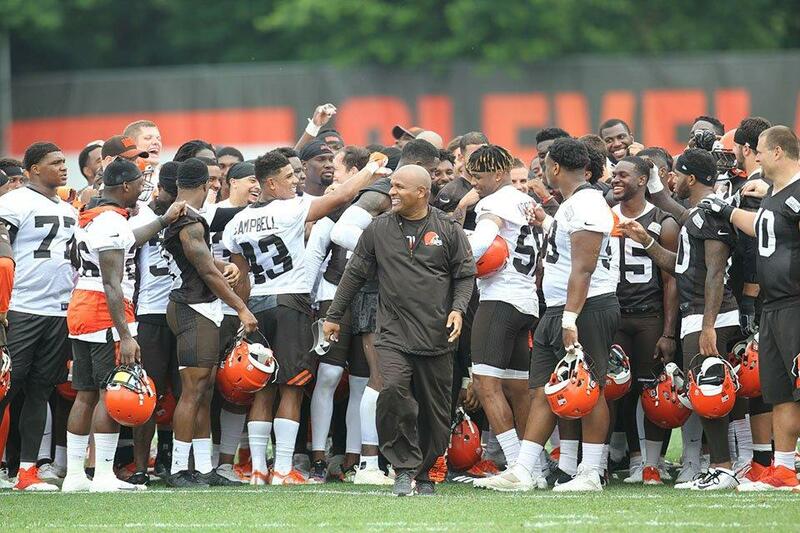 A Lake Erie-purified Hue Jackson is all smiles with the influx of talent throughout the roster. Count me solidly among the growing number of Browns fans and NFL observers who really like what we’ve seen from new GM John Dorsey and crew this off-season. It’s been an aggressive, multi-front effort to improve the roster top to bottom. But it’s not all Dorsey’s doing. Clearly the Haslams have unshackled their purse strings and personnel pickers. Following up a 1-15 season with an even worse one ought to do that to an owner. Gone now — and I hope for forever — are the days when talented contributors entering their professional prime with the team that drafted and developed them would leave as unrestricted free agents. That multiyear failing left gaping holes across the roster and robbed the Browns of continuity, veteran leadership, and depth. Combine that with the tactics of deferring draft capital and of cutting starters to avoid paying veteran salaries, and it was clear that the severe suckage was all part of a plan. Maybe the losing went a little too far. OK, a lot too far. Instead of losing the likes of Alex Mack, Mitchell Schwartz, Tashaun Gipson, T.J. Ward, Craig Robertson, et al., they’ve shelled out to keep their own key players in the fold: Joel Bitonio, Chris Kirksey, and now Duke Johnson. They traded for Jamie Collins and Jarvis Landry and promptly signed them to multi-year extensions. That’s a nice nucleus of proven producers still in their mid-’20s. Not ditching serviceable veterans to save salary! In recent years, the Browns released Joe Haden, Gary Barnidge, Demario Davis, Karlos Dansby, John Greco, and others. This year, only 30-year-old CB Jason McCourty fits that category. Of course, that’s because nearly all of the other highly-paid vets were already offloaded (or retired, in the case of Joe Thomas). Actually using those high draft picks! Rather than trading down and out, Cleveland has drafted first overall the last two seasons and has taken three others in the first round in that time. That’s quality and quantity among the most affordable demographic on the roster — i.e. players in their first four seasons. If young defenders like Myles Garrett, Jabrill Peppers, Denzel Ward, Larry Ogunjobi, and Caleb Brantley can step up the way Joe Schobert did last season, we’ve got something, folks. Finding a franchise quarterback the right way! Starting superannuated journeymen like Josh McCown and Jake Delhomme doesn’t work. Hoping a third-round flyer like Cody Kessler or Colt McCoy will be the next Joe Montana doesn’t work. Feeding a 21-year-old rookie like DeShone Kizer to the wolves from Day 1 doesn’t work, especially with no veteran fallback. Ignoring your own studied analysis and red flags the size of Texas to draft Johnny Football doesn’t work. So what might work? Trading for mid-career stater in Tyrod Taylor and signing journeyman backup Drew Stanton, both with winning career records, and then drafting a natural leader, Baker Mayfield, who got better year-by-year over four seasons in a big-time program. Signing second-tier free agents for depth! If you’re skimping on salary and building through the draft, you hope that youngsters can develop to capably fill backup and special teams roles. If they don’t and the losing gets out of hand, all’s the better for higher draft position. But that’s thin gruel for the paying customers. Look who was on the field for most the offensive or defensive snaps last season: Rashard Higgins, Ricardo Louis, Spencer Drango, James Burgess, Carl Nassib, Trevon Coley. How many of them even make this September’s opening day 53? Set the over/under at 1.5. This year’s training camp competition will include several veteran signees throughout the depth chart. It’s not just potential starters such as RB Carlos Hyde, LB Mychal Kendricks, RT Chris Hubbard, and CB Travis Carrie. In addition to Stanton, there’s also TE Darren Fells, DE Chris Smith, CBs Terrance Mitchell and E.J. Gaines, WR Jeff Janis, and OT Donald Stephenson (though he’s a no-show so far). In the heat of battle, having experienced situational and substitute players can make a difference in preventing fourth-quarter collapses. I’ll end with one caveat. This time of the year, the roster always looks flush. Up to 90 guys are listed. But injuries will strike. They always do. Already CB Howard Wilson is lost for the second straight season, and two others (P Britton Colquitt and rookie DE Chad Thomas) are recovering from off-season surgery. When training camp opens in late July, the depth of this rebuilt roster will be tested. It’s sure to prove stronger than it has in a long, long time. This entry was posted in Uncategorized on June 13, 2018 by Dave Algase.